Though the Equity Markets ended with gains on Thursday, the session remained extremely range bound and the benchmark Index NIFTY oscillated in a 20-point range throughout the day making no directional headway. The Index gained 39.10 points or 0.37% but showed no conviction on either side. As we approach the last trading day of the week, we see Friday’s trade getting initiated on a quiet note once again. The Markets are showing lot of inherent buoyancy but if we speak of immediate short term, some consolidation is now getting long overdue. It would be healthy for the Markets if it spends some time oscillating in a capped range. This will make the current pullback more healthy, sustainable and potent to scale higher levels. 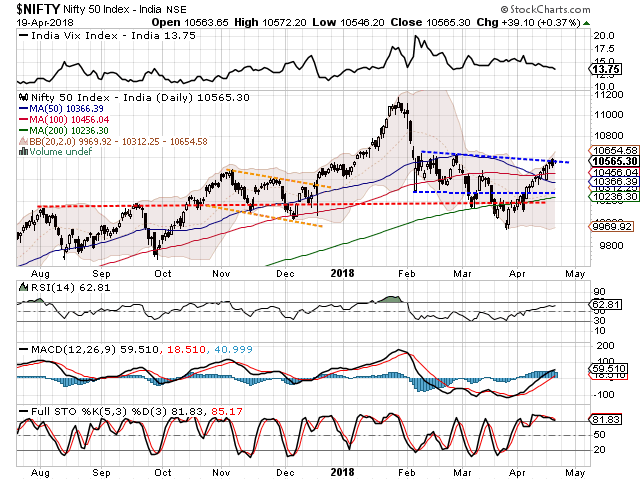 The Friday’s trade will see the levels of 10580 and 10625 act as resistance levels. Supports have shifted littler lower at 10510 and 10465 zones. 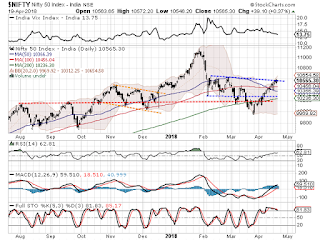 The Relative Strength Index – RSI on the Daily Chart is 62.8027. While it marked a fresh 14-period high, it remained neutral against the price showing no divergence of any kind. While Daily MACD continued to stay bullish, no significant formations were observed on Candles. Pattern analysis of the Daily Charts shows the Markets trying to break out from the pattern resistance area that it is being encountered. The Markets are trying to break out from a rectangle formation which resulted out of a broad trading range. Overall, it is beyond doubts that the inherent buoyancy in the Markets is quite visible. However, the current structure on the Daily Charts looks bit overstretched and possibilities of a profit taking bouts from higher levels cannot be ruled out. NIFTY PCR (Put to Call Ratio) which is currently at relatively higher levels might restrict the up move as well. We strongly advise to refrain from creating shorts as the undercurrent remains bullish. However, with possibilities of Markets encountering volatile profit taking bouts at higher levels, vigilant protection of profits is advised. While adopting a very cautious view on the Markets, all profit taking bouts, if any, should be continued to be used for making select purchases. Fresh long positions were seen being added in VEDANTA, JSW STEEL, NATIONAL ALUMINUM, IFCI, SOUTH BANK, TATA MOTORS, GODREJ PROPERTIES, CENTURY TEXTILES, ITC, POWER GRID, LARSEN & TOUBRO and ONGC.